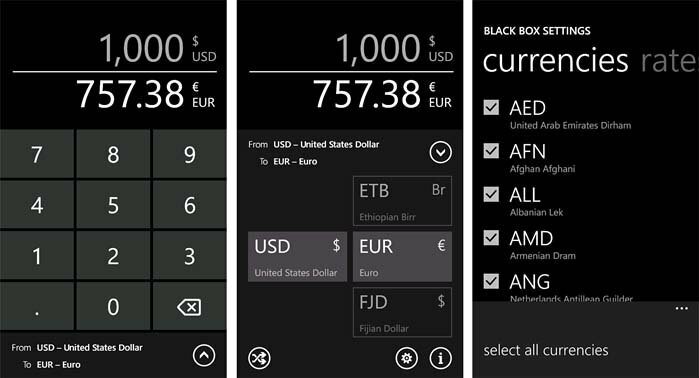 It may not be the flashiest Windows Phone app but Black Box is a clean, simple to use, currency converter. Black Box converts currency amounts for more than 150 currencies and you can thin out the list a bit in the settings menu. Black Box's layout is simple and straight forward. You have your currency amounts listed up top, a number pad and your conversion listing at the bottom of the screen. Tap on the up arrow in the bottom right corner and you will pull up your options menu. Here you can choose the currencies involved in the conversion, flip the conversions, access the settings, and view the about screen. 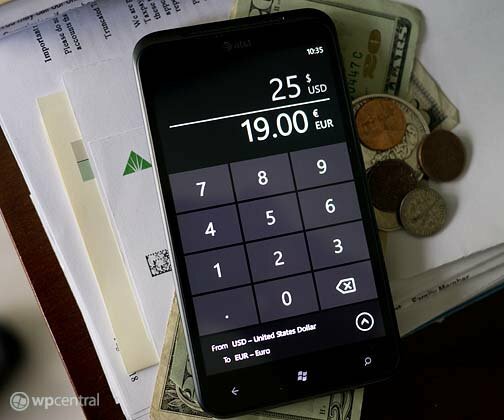 From the settings menu you can thin the currency list a bit by un-checking any currency you do not use. Black Box updates conversion rates automatically and this feature can be disabled in the settings as well. Black Box may lack the visual appeal of Currency Converter Pro but if you're looking for a clean and simple conversion app, it's worth considering. There is a free trial version for Black Box with the full version running $.99. You can find Black Box here at the Windows Phone Marketplace.